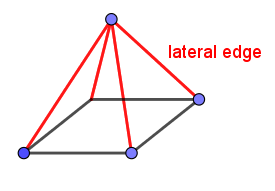 Lateral Edge: the edge between two lateral faces of a polygon. The lateral edge of a polyhedron is an edge of the polyhedron that is on the side of the polyhedron. McAdams, David E.. Polygon . allmathwords.org. All Math Words Encyclopedia. Life is a Story Problem LLC. 8/31/2018. http://www.allmathwords.org/en/p/polygon.html. McAdams, David E. Lateral Edge . 12/21/2018. All Math Words Encyclopedia. Life is a Story Problem LLC. http://www.allmathwords.org/en/l/lateraledge.html.